In VerticalChange, you have the option to create a new Basic Person or Basic Group with general information like First and Last Name. 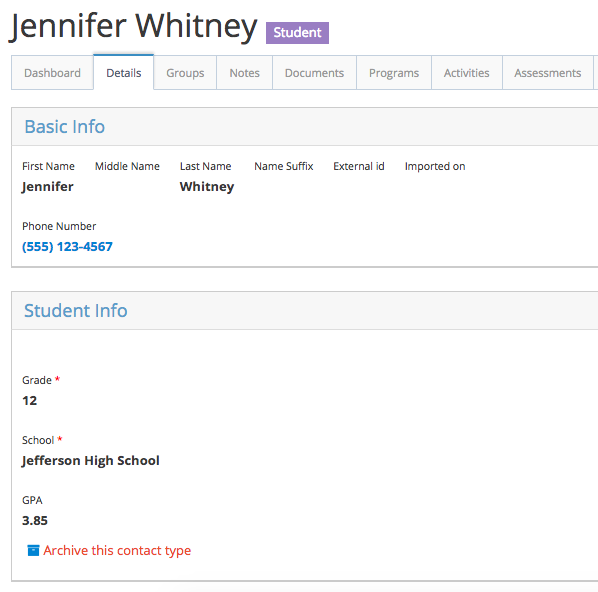 You can also create an person or group contact of a particular type - for example: Student, Provider, Classroom, Family, etc. If you were creating a new Student contact, you may want to collect information such as their grade level, school name and GPA. Then you may want to create a new Teacher contact with their school, the grades they teach and their certifications. 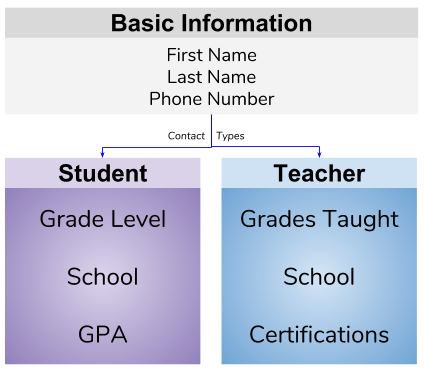 While the two could share a school name field, grade level and GPA wouldn't be relevant to the Teacher, and grades taught and certifications may not be relevant to the Student. Instead of asking for all of this information for every contact, you can specify a type for your contact, which will allow you to collect specific information about the contact based on fields that are set by your administrator. You will see when you create a new contact, and choose a type from the Create button's drop-down menu, that additional fields for the type are included. Take a look at one of your contact's profile. Next to their name at the top of the page, there will be a purple box that indicates what type of contact they are. If no type is specified when the contact is created, it will default to a "Basic Contact". There are so many things you can do with contact types, like changing the type, adding more than one, and removing the type. In the next series of articles, we will walk you through how to perform various actions on contact types.